Cabinet des Fées: an online journal of fairy tales began in 2005 as a result of our love of fairy tales, from the folktales that preceded them through the modern literary offerings by such authors as A.S. Byatt and Anne Sexton. Our mission has been to publish stories and poems that reflect the diversity of folk and fairy tales from around the world, refusing to overlook the wealth of stories that have their origins elsewhere, and have been proud to follow in the footsteps of collectors and anthologists like Angela Carter, Jane Yolen, and Terri Windling in publishing tales inspired by far-flung cultures and diverse sources. Cabinet des Fées is now on hiatus, although we can still be reached on our facebook page. Our editorials and announcements and other news can be found in Our Grim(m)oire. You’ll also find Storytellers on the site, including live readings of the fantastic in literature. In Fairies and Fairy Tales you’ll find essays by respected authors, editors, scholars and other assorted personalities in the fields of fairy tales, folklore and myth. Interviews offers just that, and in Media Reviews you’ll find a wide variety of media reviews by our staff and reviewers. The publishing venture of Cabinet des Fées has been a fluid thing over the years. Scheherezade’s Bequest began as our micro webzine, each issue offering short stories and poetry drawn from the field of fairy tales, be they old tales retold or new tales that move the tradition forward. Shortly after the first issue of Scheherezade’s Bequest was published, Prime Books offered us the opportunity to produce a print issue, which we did in one volume of three issues named after this website: Cabinet des Fées, a fairy tale journal. 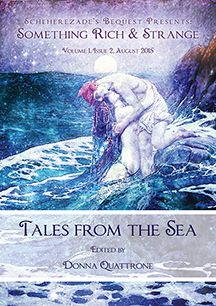 Our first two issues offered academic material as well as a collection of short stories. Our third issue was fiction only. 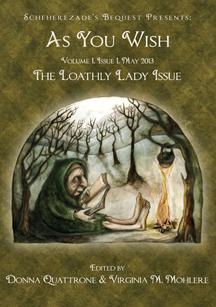 All of the issues contain a lengthy editorial by Helen Pilinovsky and cover art by Charles Vess. Meanwhile, Scheherezade’s Bequest continued to offer poetry and fiction online, until we eventually moved that to print as well. So far we have produced two issues in volume one of the print edition. Our founders were Erzebet YellowBoy Barthold (editor-in-chief), Helen Pilinovsky (academic editor), and Catherynne M. Valente (advisor). Scheherezade’s Bequest editors were Virginia Mohlere and Donna Quattrone, and Nin Harris founded and edited Demeter’s Spicebox, an original microzine hosted by CdF.